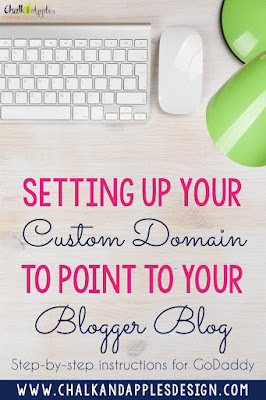 You can use a custom domain with your Blogger blog to change your URL from yourblog.blogspot.com to www.yourblog.com. The process is pretty simple, but it can be tough to find all the information you need in one place. 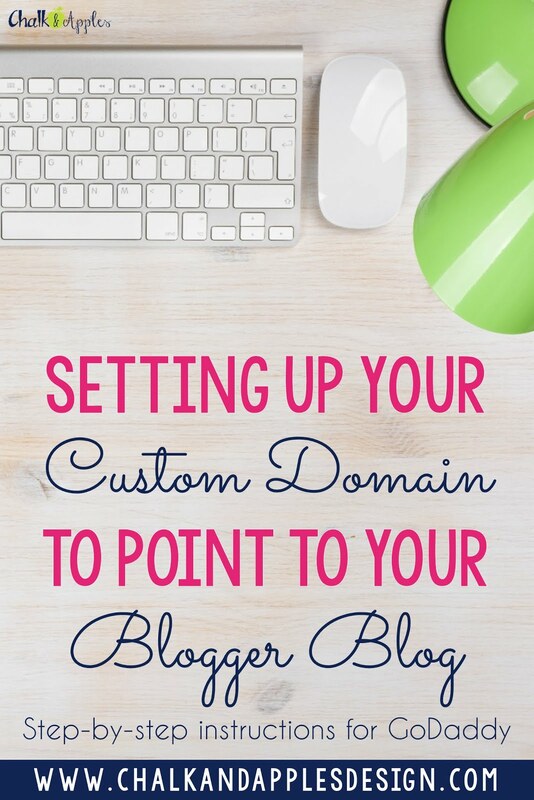 Once you purchase your domain name, you will need to set it up to point to your blog. 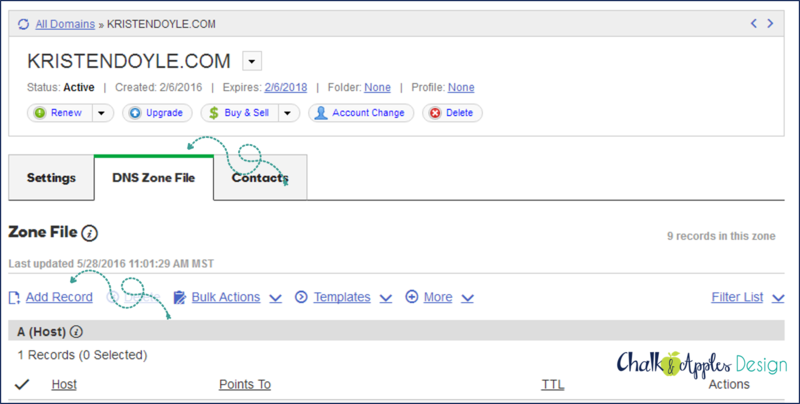 Here's how to do it with GoDaddy. 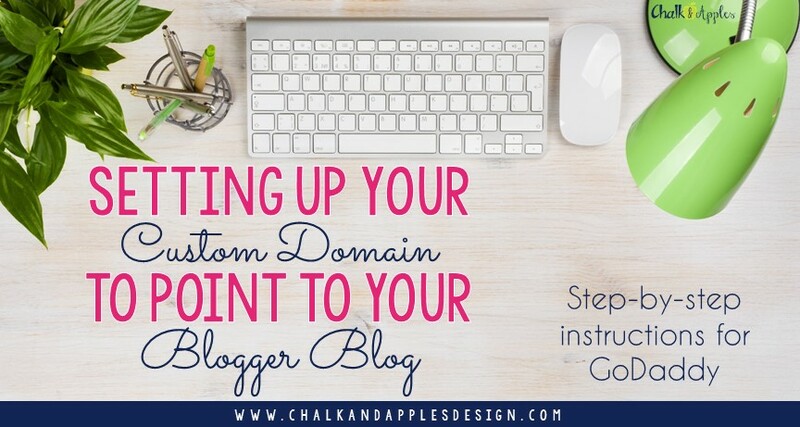 If you use someone else, the basic steps will be the same, but it might look different depending on your domain registrar. If you haven't purchased your domain yet, you can do so at one of many domain registrars online. My personal favorite is GoDaddy. This referral link includes an offer for $0.99 for your first year. 2. 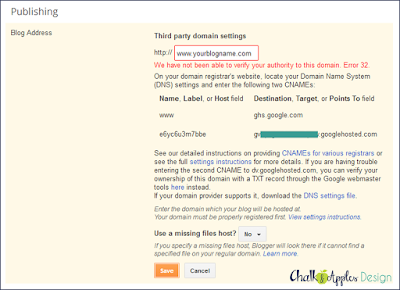 Add your domain to Blogger. Leave this window open, because you will need the Host Names and Destinations that popped up. These are specific to your blog. 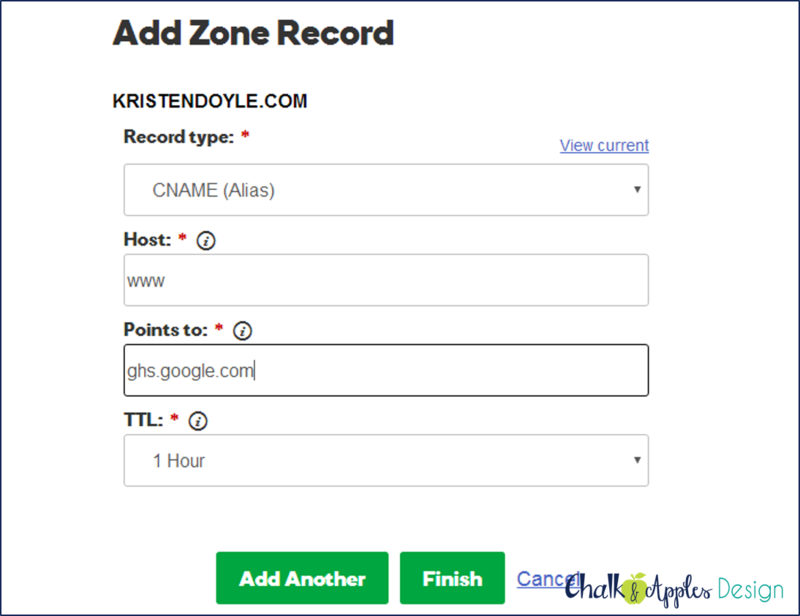 In a new tab or browser window, log in to your GoDaddy account. Beside Domains, click Manage. Click the DNS Zone File tab. Then click Add Record. 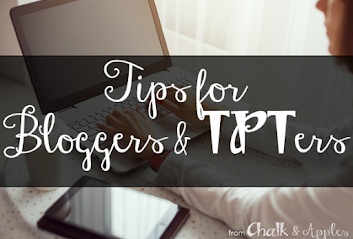 Now add the info from the second row of your Blogger error message the same way. These two will be a random string of letters and numbers unique to your blog. The shorter set is the Host, and the long one goes under Points to. Click Add Another. 4. Set up for redirect to "www"
You know how most sites are technically www.something, but you don't have to type the www to get to the site? That's not automatic. It's something you need to set up. And you definitely want to do it! Think about it... How many times do you type www.sitename.com versus just typing sitename.com? It's easy to set up, but this is a must do! You should still be in the "Add a Zone Record" window on GoDaddy. Change the dropdown menu to A (Host). Add all four of the following IP addresses, one at a time, just like you added the records in step 3. The host for all of these is just the @ symbol. Click Add Another after each one, and click Finish when you've added all of them. Look at your list of A (host) records. You should see the four that you just added. If you also see one that points to 50.63.202.20, delete it using the trash can icon on the right. On your Settings page, click the edit button beside your new URL. 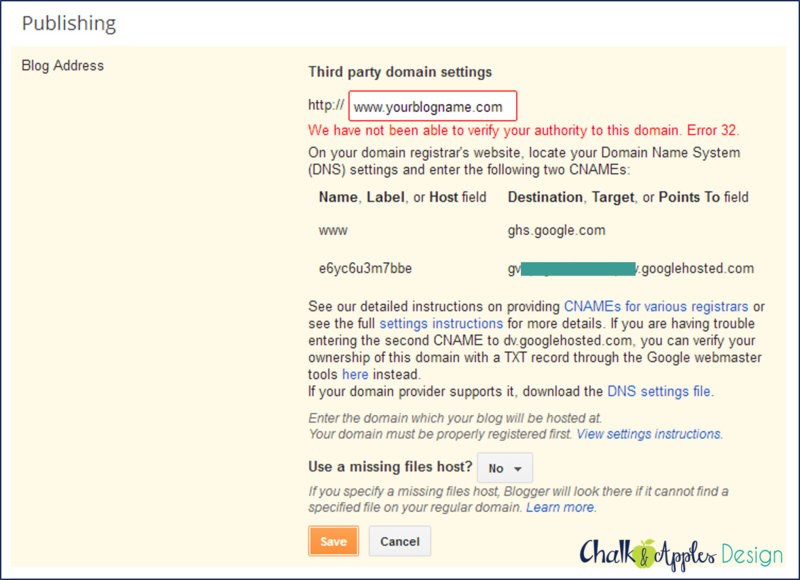 if you see a checkbox under your URL that says "Redirect yourblog.com to www.yourblog.com," you need to check it. Try to save your new URL again. This time, it should save without an error. Occasionally, you will need to wait 30 minutes to an hour before it will save in Blogger without the error message. If you have trouble at first, wait a little while, and try again. Test your link - it will usually be live almost instantly, but on rare occasion it could take anywhere from an hour to 2 days. Thank you so much! I was a nervous wreck but your directions were great! Thank you Sandy! I'm so glad these directions helped you! This proved to be very useful for the most part! ^^. But I still have trouble with the www redirect. I addded all those IP addresses correctly but it's still not functioning! Do you have any idea why could that be?